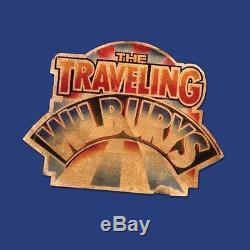 TRAVELING WILBURYS - Traveling Wilburys (2CD/1DVD, Deluxe Edition), Audio CD New. Message us for return instructions. Record Label: Rhino Records (2), Wilbury Records. Featuring classics like "Handle With Care, " "End Of The Line, " and "Heading For The Light, " super-group Traveling Wilbury's Collection highlights all of the band's music and previously unreleased bonus tracks through this re-mastered double album. The DVD features behind the scenes footage of the band writing and recording, along with their 5 video clips. Limited edition Deluxe package includes 40-page booklet and other exclusive extras. The Traveling Wilburys were one of the few supergroups that lived up to their promise, because they didn't try to. Things started inauspiciously when George Harrison, needing a B-side for a 1988 single, called in friends Jeff Lynne, Bob Dylan, Tom Petty, and Roy Orbison for assistance. Two albums later--the second without Orbison, who had passed away shortly after the first was released--the loose-knit collective had recorded material that was as durable, and occasionally eclipsed, the participants' legendary solo work. The Wilburys succeeded due to a genial and contagious camaerie that permeates both discs. What could have been a train wreck of ego clashes instead resulted in a frothy meeting of the minds. These guys are having a blast, ting lead vocals and harmonies on energetic folk-k, quir kabilly, and Beatlesque pop that shimmers with the respect and esteem the members clearly hold for each other. Harrison and Lynne's rather slick production polishes off edges that might better have been left unvarnished, but there's no denying the loosey-goosey craftsmanship at work in tunes such as "Handle with Care, " "End of the Line, " and a striking Orbison performance on "Not Alone Anymore" that ranks with any of his finest. Both albums were million-sellers, but oddly went out of print for about a decade until Rhino resurrected them, adding two rare tracks per disc as well as a DVD of music videos and a band documentary. The resulting package is a comprehensive overview of a once--well, twice--in-a-lifetime project that, especially after Harrison's passing, will never be repeated. We will work with you to resolve any problem you may have. We reserve the right to cancel any order for any reason at any time. We are not responsible for undeliverable addresses. All of our items, unless otherwise stated, will only run on 120 volts. Please check to make sure your country complies with these specifications. The item "TRAVELING WILBURYS Traveling Wilburys (2CD/1DVD, Deluxe Edition), Audio CD New" is in sale since Thursday, May 28, 2015. This item is in the category "Music\CDs". The seller is "fanteller" and is located in US. This item can be shipped to United States, to Canada, DK, RO, SK, BG, CZ, FI, HU, LV, LT, MT, EE, to Australia, GR, PT, CY, SI, to Japan, to China, SE, KR, ID, to Taiwan, ZA, TH, to Belgium, to France, to Hong Kong, to Ireland, to Netherlands, PL, to Spain, to Italy, to Germany, to Austria, RU, IL, to Mexico, to New Zealand, PH, SG, to Switzerland, NO, SA, UA, AE, QA, KW, BH, HR, MY, TR, BR, CL, CO, CR, DO, PA, TT, GT, SV, HN, JM.